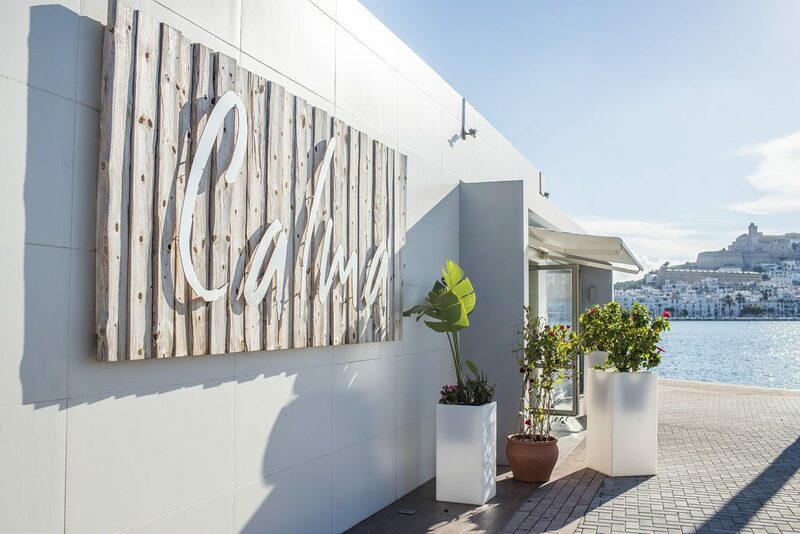 Smack bang in the centre of Paseo Juan Carlos I, is Marina Ibiza and the gorgeously yachty La Calma. Oozing a sophisticated jet set vibe the view of Dalt Vila from here is spectacular. This is a food, drink and view emporium! But Patchwork, the rooftop restaurant and bar of the Sa Punta complex in Talamanca is where the view is OMG-out-of-this-world. Have a few cocktails and share some Lebanese plates while gazing across the rippling med to the old town. 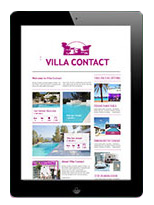 Benirras beach is the ultimate egalitarian hang out and the best place to grab a drink and check out the soft white sands that reach down into the crystal sea is Elements Ibiza, the sprawling restaurant dominating much of the beach. This is the stuff dreams are made of. Palm trees sway in front of the glistening sea that stretches on forever at the bar of this five star hotel and spa set in the hills of San Miguel in the island’s north. Heaven. The terrace bar has a breathtakingly uninterrupted view across a rocky outcrop towards the horizon on the outskirts of San Antonio. 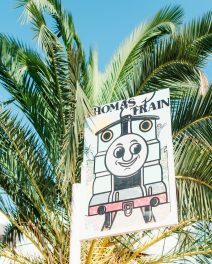 Recently refurbished this subdued corner of Ibiza has become a sunset institution for those in the know. 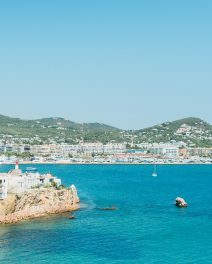 With its chic hippy vibe, stone pirate tower, fire dancers and incredible sunset view, this beach bar in Cala de Bou on the island’s west coast is where everyone dances barefoot in the sand, carefree and happy. 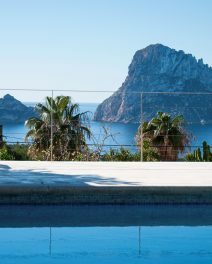 Atop the five star Aguas de Ibiza Lifestyle & Spa hotel in Santa Eulalia is Spanish celeb chef Sergi Arola’s newest Vi Cool instalment. Sup on quality wines and cocktails accompanied by Arola’s unique take on tapas while overlooking the beautiful view. The little village of Santa Agnes is nothing more than a road, a bar and almond groves. Drive up through the hills to the dramatic clifftop and you’ll come to this lovely locals hangout with one of the most remarkable views in the world. The name translates to ‘gates of heaven’ – need we say more? Those Adría brothers know how to put on a show. Set in the swanky Ibiza Gran Hotel, Heart Ibiza is a cornucopia of molecular tapas and theatrical surprises supplied by Cirque du Soleil plus the world’s best DJs until dawn. This old town bar is so cute and tiny, and the best (in fact, the only) place to sit is on the staircase outside on comfy cushions and beanbags. Grab a cocktail and a plate of nibbles, sit back and soak in the medieval ambience of the old town.